Eat this healthy snack anytime! 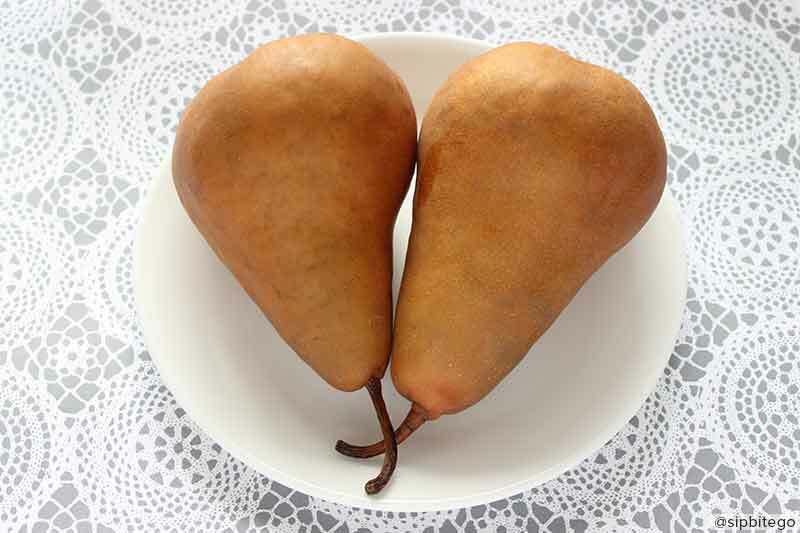 This recipe uses brown Bosc pears. The pears are sliced and boiled. 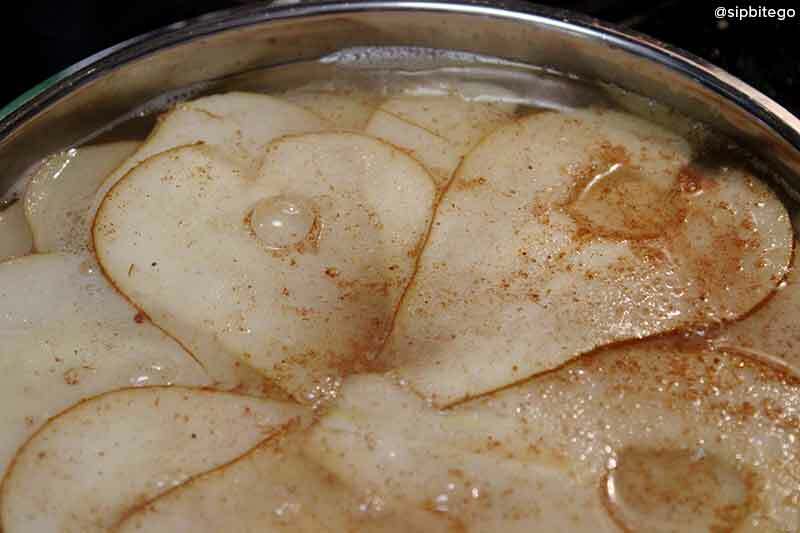 Sugar and cinnamon (or ginger, nutmeg or cloves) are sprinkled on the pears. 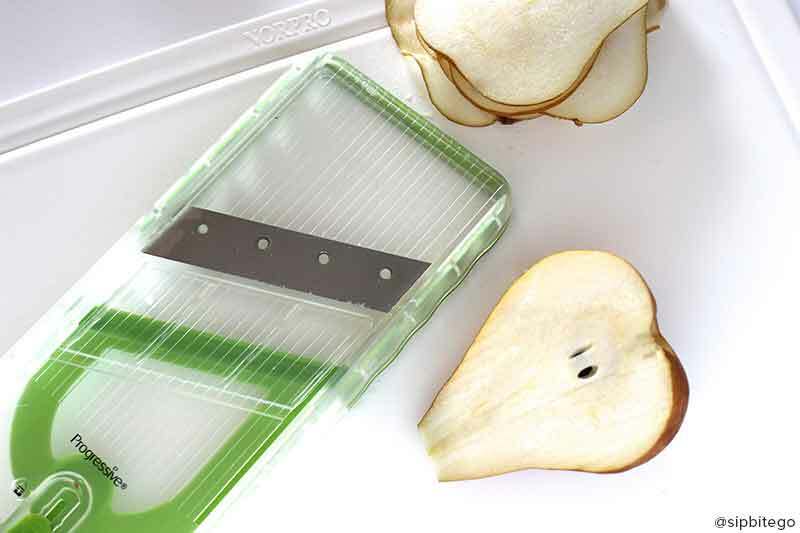 The pear slices don’t have to be paper-thin, but they should be consistent in thickness. If you don’t own a mandolin, here’s an affiliate link to the progressive mandolin I use. These pears were sliced on the #2 setting. 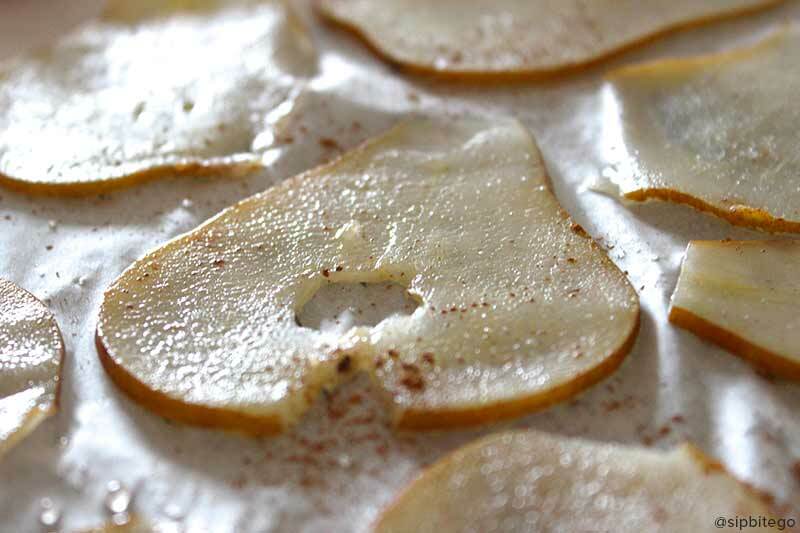 These pear chips will stick to a cookie sheet without parchment paper, so definitely use it! 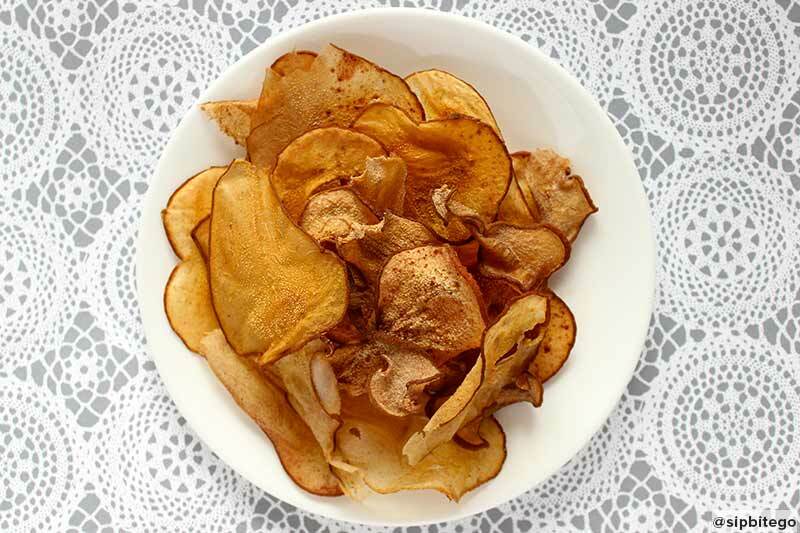 Enjoy your cinnamon pear chips! Like healthy snacks? These peanut butter and chocolate banana bites are favorite around here. And these sweet fried plantains are delicious. And if you’re looking for another interesting pear recipe, check out this savory pear and goat cheese pizza. It’s perfect for Fall and Winter! 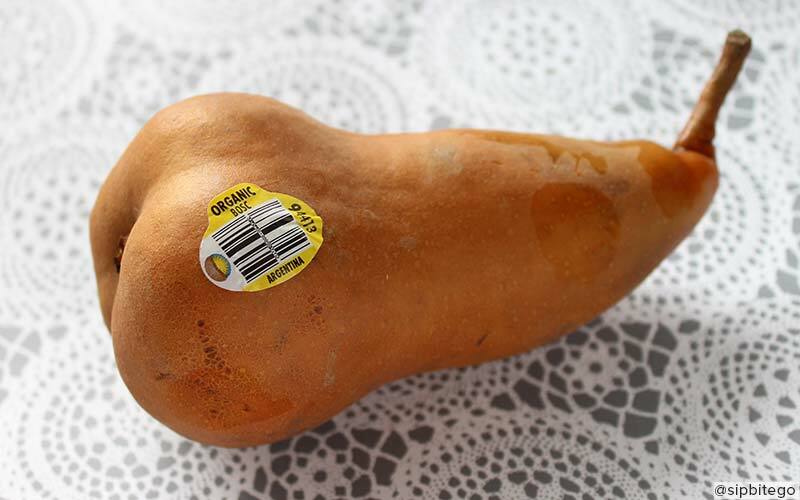 Your pear-obsessed foodie friend, Jenna. 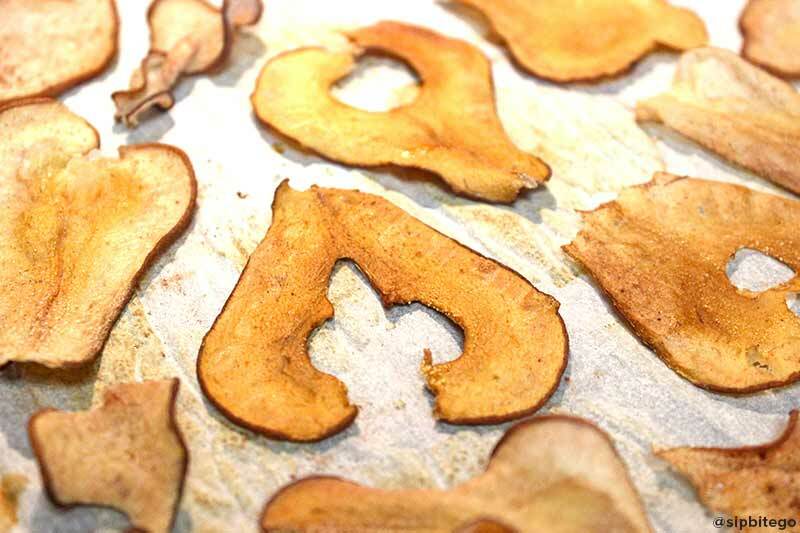 Here's a Fall favorite: healthy cinnamon pear chips with cinnamon and sugar. It's a healthy, in-season snack. For more recipes, visit sipbitego.com. First, set everything up... Set your oven to 250. Bring a pot of water to a boil. Line baking sheets with parchment paper. Mix together spices and sugar. Set aside. Prepare the pears. Remove the top and bottom and slice them on mandolin setting #2. Then boil pear slices for 1 minute. Drain pears and arrange them on cookie sheets. Sprinkle the spice mixture on the pears and put them in the oven. Check on your pear chips every 30 minutes. Depending on the oven, estimate 1.5 - 2 hours of continuous bake time. It takes a bit of guess work and sampling to tell when they're done. You may want to flip them for the final 30 minutes. The chips will usually crisp up after a few minutes drying out of the oven.